Production: Film Gaumont, Paris; serial in 12 episodes: 1. L'ombre mysterieuse ; 2. L'erpiation ; 3. La meute fantastique ; 4. La secret de la tombe ; 5. Le moulin tragique ; 6. Le môme reglisse ; 7. La femme en noir ; 8. Les souterrains du chateau rouge ; 9. Lorsque l'enfant parut ; 10. Le coeur de Jacqueline ; 11. Ondine ; 12. Le pardon d'amour. Length: between 427 and 1262 meters per episode. Released together, 16 December 1916. Screenplay: Arthur Bernède and Louis Feuillade; photography: Klausse and A. Glattli. 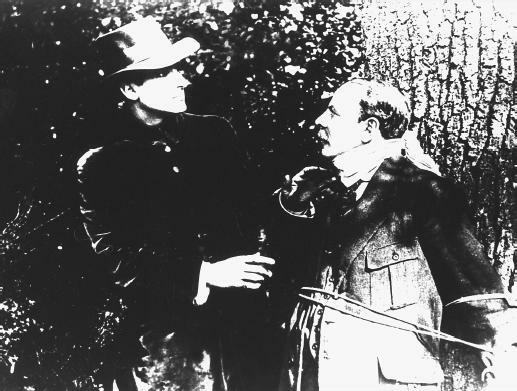 Cast: René Cresté ( Judex ); Musidora ( Diana Monti, Mlle. Verdier ); Yvette Andreyor ( Jacqueline ); Marcel Levesque ( Cocantin ); Bout-de-Zan ( Le Môme reglisse ); Louis Leubas ( Favraux ); Edouard Mathé ( Roger de Trémeuse ); Georges Flateau ( Vicomte de la Rochefontaine ); Gaston Michel ( Le vieux Kerjan ); Jean Devadle ( Morales ); Yvonne Dario ( Comtesse de la Trémeuse ); Olinda Mano ( Le Petit Jean ); Juliette Clarens ( Gisèle ). Delluc, Louis, Cinéma et compagnie , Paris, 1919. Védrès, Nicole, Images du cinéma français , Paris, 1945. Lacassin, Francis, Louis Feuillade , Paris, 1964. Anthologie du cinéma 2 , Paris, 1967. Armes, Roy, French Film , New York, 1970. Barsacq, Léon, Caligari's Cabinet and Other Grand Illusions: A History of Film Design , New York, 1976. Bioscope (London), 26 July, 2 August and 23 August 1917. Beylie, Claude, "Louis Feuillade," in Ecran de France (Paris), 15 May 1959. Cinéma (Paris), no. 84, 1964. Lacassin, Francis, "Louis Feuillade," in Sight and Sound (London), Winter 1964–65. Roud, Richard, Maker of Melodrama," in Film Comment (New York), November-December 1976. "Louis Feuillade," in Film Dope (London), September 1978. Champreux, J., "Louis Feuillade, poète de la réalité," in Avant-Scène du Cinéma (Paris), 1 July 1981. "Judex Issue" of Avant-Scène du Cinéma (Paris), April 1984. Redi, Riccardo, in Bianco e Nero (Rome), January-March 1987. Beylie, C., " Judex et Les vampires ," in Cinema 91 , no. 482, November 1991. Masson, A., "Voila le passage secret!" in Positif (Paris), January 1993. "Feuillade and the French Serial," in Velvet Light Trap (Austin), no. 37, Spring 1996. Callahan, Vicki, "Detailing the Impossible," in Sight & Sound (London), vol. 9, no. 4, April 1999. Unlike Feuillade's earlier Fantômas and Les vampires , Judex celebrates the exploits of a defender of the law and upholder of right and wrong rather than glorifying crime and ridiculing the police. Indeed, Feullade himself described it as "a spectacle for all the family, exalting the most noble sentiments." Such a change of tack can no doubt be explained partly by the censorship problems faced by Les vampires , which the Ministry of the Interior found too "demoralising" for wartime, and in which certain spectators found rather disturbing echoes of the activities of the anarchist Bonnot gang, which had terrorised Paris in 1912. The twelve episodes of Judex are among the peaks of the French serial, which has become somewhat eclipsed by its American counterpart. In France, the serial was a development of the prewar series film which had its roots in the popular literature of the time— indigenous and imported cheap paperbacks, and the serialised stories to be found in weekly magazines and parts of the daily press. Fantômas was one such series (running to five separate films), and others featured heroes such as Nick Winter, Zigomar, Onésime, Rocambole, and Boute-de-Zan (The Liquorice Kid, who also crops up in Judex ). At their height, the French serials proved a valuable counterweight to the flood of American imports and, to quote Feuillade again, showed that "French production is not definitively outclassed by the Americans and that we are not henceforward going to be reduced always to be following in others' footsteps." a former friend, Favraux. Spurred on by his mother, he swears to wreak revenge for his father's death and, disguised in black cape and broad-brimmed hat, he sets out in pursuit of Favraux. Believing that he has killed him, he falls in love with Favraux's beautiful daughter, the young widow Jacqueline, only to discover that Favraux is still alive after all. Judex imprisons him in the dungeons of a ruined castle in which he has built a laboratory, but Favraux's evil schemes are by no means at an end. No synopsis could adequately communicate the flavour and atmosphere of Judex , whose basic story is simply a pretext for a seemingly endless and remarkably inventive series of incidents and striking moments. Feuillade may have reversed the moral order of Les vampires , but both films inhabit the same mysterious universe, underlined by the reappearance of the great comic actor Marcel Levesque as the detective Cocantin and Musidora as the vamp-ish Diana Monti. Both, along with Bout-de-Zan, were very much part of Feuillade's stock company, and Musidora herself went on to direct a number of films. Even the titles of the episodes are evocative—for example, The Mysterious Shadow , The Fantastic Hounds , The Secret of the Tomb , The Tragic Mill —and although Feuillade was dismissed by critics of the time as beneath serious consideration it should come as no surprise to discover that he was feted by the Surrealists and also now tends to be regarded as one of the precursors of "poetic realism." What particularly attracted the Surrealists to his work was his sense of landscape and place, and in particular his entirely unforced co-mingling of the fantastic and the everyday. Like so many of the Surrealists' heroes, Feuillade had discovered the secret of revealing the surreal behind the real: by setting fantastic happenings in familiar, modern environments he succeeded in revealing the mysterious poetry of the urban and every day. Or as Breton and Aragon put it, in Feullade's films "one discovers a real sense of our century." With his distinctive hat, and black cape tossed over one shoulder, Judex rapidly became something of an iconic figure. Just as the early series and serials had drawn on the printed word for inspiration, so the story of Judex was serialised in Le petit Parisien. Judex was followed in 1918 by La nouvelle mission de Judex , and was later re-made twice—the first time by Feuillade's son-in-law Maurice Champreux in 1933, and the second by Georges Franju in 1963, from a script co-written by Feuillade's grandson Jacques Champreux.